Description: A deciduous shrub growing to 6 feet. Its woody stems are generally thorny and it has pale green leaves containing 3-7 leaflets. It blooms with white flowers that produce red edible berries. Habitat: Native to Europe and Asia, it now grows wild and is also widely cultivated in many temperate regions. 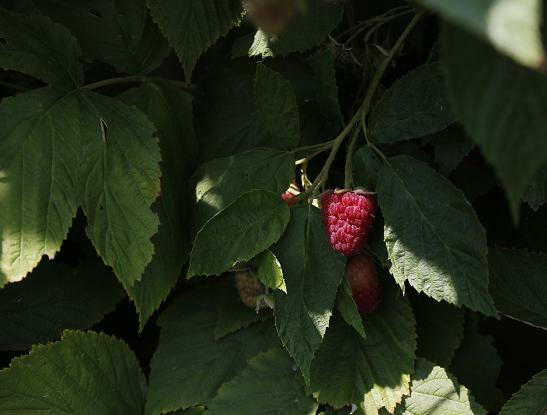 It is a common plant throughout many parts of the U.S.
History & folklore: Raspberry leaf has been used for hundreds of years and is known to have numerous benefits. It is most widely known for its ability to tone the uterus, making it a popular choice for women who are about to give birth. In 1735, Irish herbalist K’Eogh described other uses for raspberry: "An application of the flowers bruised with honey is beneficial for inflammations of the eyes, burning fever and boils…the fruit is food for the heart and diseases of the mouth." Medicinal uses: Raspberry is known to have both astringent and stimulant properties which account for its ability not only to strengthen uterine muscles, but to tone pelvic muscles as well. Some of the many ailments that this herb can allay include burns, conjunctivitis, diarrhea, morning sickness, P.M.S., and sore throat. Magical/ energetic uses: The raspberry plant is associated with fertility as are most plants whose fruits contain many seeds. The leaf and fruit can be dried and made into an herbal amulet to protect and strengthen the female reproductive organs or a pregnancy. It is also said that steeping the berries in wine and serving them to a lover will strengthen the relationship. The plant, when grown near a home or business offers both physical and energetic protection.